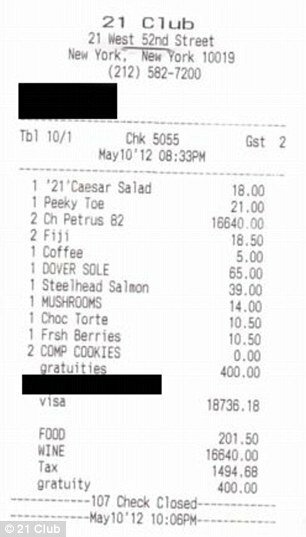 Two business associates visiting New York City spent $16,640 on two bottles of Petrus ’82 wine alone at 21 Club. The pair’s waiter said he had to do everything he could to keep his jaw from crashing to the ground when they ordered the second bottle. “He said: <<Bring us another one>>”, the 21 Club’s wine director Phil Pratt told the New York Post. “It’s one of the most famous wines in the world,” he said. The landmark speakeasy restaurant says it has sold only five similar bottles in the last three decades. With the two bottles’ sale to the first-time diners this past May, “21” reports having only three left in their cellar after ordering 12 when the bottles first came out. “It’s not a wine we normally sell,” said Phil Pratt who was especially stunned when the diners ordered the bottles on what felt like a pure whim. They accompanied the first bottle with appetizers of a house caesar salad and peekytoe crab salad. Once their appetizers were finished, Phil Pratt said he was summoned over again, with the couple’s request to bask on a second bottle over plates of dover sole and steelhead salmon. “It was a little strange, especially when one of the guys was drinking coffee throughout the meal, too. But I don’t judge. It’s their money; they can do what they want with it. If he wants Coca-Cola in his wine, I’m OK with that,” Phil Pratt told the Post. Despite an obvious world-wide desire for the wine, and the restaurant’s remaining few bottles possibly rising in price, Phil Pratt told the Post that he doesn’t expect them to stock up on more. He said counterfeit wine is largely to blame. “There’s an old saying that more bottles of ’82 Petrus have been sold in Las Vegas than ever existed,” he said. It’s a risk he said they’d rather not take with their continuing purchase. The men’s check closed at $18,736.18, with a $400 gratuity and two complimentary cookies thrown in on the side.